Additionally, the Long Term Care benefit increases through the years as your annuity increases in value. Should you never activate the Long Term Care provision of the annuity your account balance will pass to your beneficiaries. In other words, if you never use it, you don’t lose it. Either you or someone you care about will eventually receive the annuity account balance. Twin brothers, James and Larry each inherit $100,000 at the age of 65 and are in the 28% income tax bracket. James invests his $100,000 in CDs paying an average 2% annually (wishful dreaming). Larry on the other hand takes our advice, and invests his $100,000 in The LTC Annuity Strategy. Ten years later while on a fishing trip, their boat is struck by lightning and the brothers sustain injuries that prevent them from performing 2 of the 6 Activities of Daily Living. The CDs that James invested in grew to $115,370, after taxes. This is all the money he would have to pay for his long term medical care expenses. Because Larry’s medical condition triggered the LTC provision of his LTC/Annuity, his available pool of money increased to a whopping $338,694 or $4,704 for 72 months, all available income tax-free! With the average cost of Long Term Care in his state topping $80,000 per year, James spent all of his CD funds in less than two years and had to go on Medicaid. Larry on the other hand, received $4,704 tax-free per month for 6 years that was applied toward any Long Term Care expense. The LTC Annuity Strategy is an excellent place to transfer low paying certificates of deposit (CDs), Treasuries, money market funds. If you have an old annuity with accumulated taxable gain you can exercise your right to exchange your annuity into the LTC Annuity Strategy without any tax consequences because of Section 1035 of the Internal Revenue Code. Furthermore, any gain from your old annuity which normally would be taxed at your ordinary income tax rate, if used for LTC expenses can be extracted income tax-free if moved into an LTC compliant annuity. We are finding recently, with the overall market interest rates so low, many older annuities, can be 1035 exchanged and incur minimal surrender charges if any. The charges are typically much less than illustrated in the contracts’ surrender schedules. This is because of the “Market Value Adjustment” component found in most Fixed and Indexed Annuities. The Market Value Adjustment basically means your surrender charges will decrease if interest rates (as measured by the 10 Year Treasury Note) decrease from the time the annuity was purchased. The main advantage of exchanging the old into a new LTC Annuity is the “expanded Long Term Care value” (up to three times more than the transfer) if activated, will be paid out income tax-free if used for Long Term Care. Sarah Smith, 70 has an annuity valued at $100,000, with an original cost basis of $40,000 that is currently earning 3%. She elects to exchange her fully taxable annuity into The LTC Annuity Strategy. Five years later, at age 75, she triggers the Long Term Care benefit. 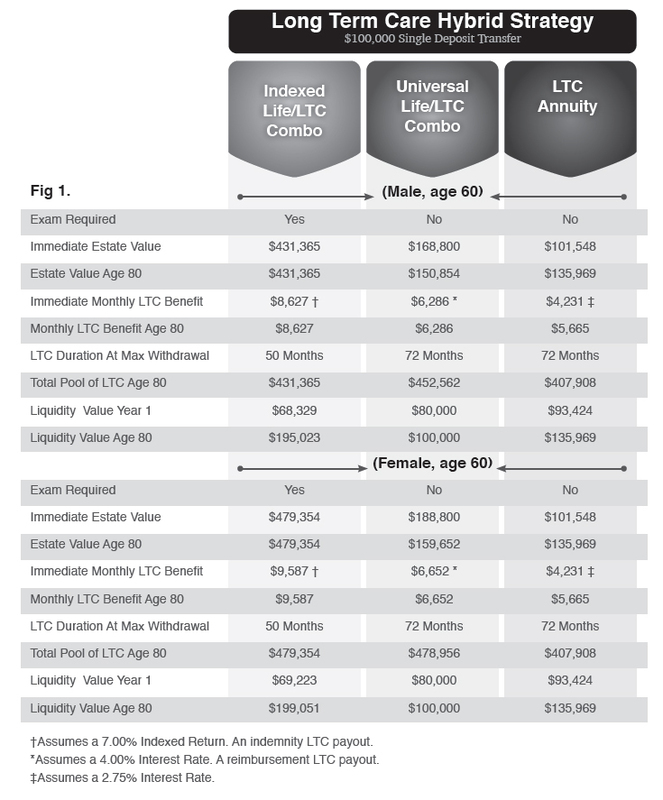 Instead of having $115,927 in her old annuity to draft from, (of which $75,927 would have been taxed as ordinary income) she would have a remarkable expanded LTC account value of $310,798, which translates to a monthly income tax-free LTC benefit of $4,317 for 6 years……guaranteed! Initially the only way to open a LTC Annuity account was to make a lump sum transfer. Now, because of the great sums that are in qualified accounts like an IRA, one insurance company allows for subsequent deposits spread out over four years. Similar to the Roth on Roids LTC Strategy, you can qualify for the Long Term Care coverage today and stretch your tax liability out over four years, making four equal deposits into the LTC Annuity Strategy. 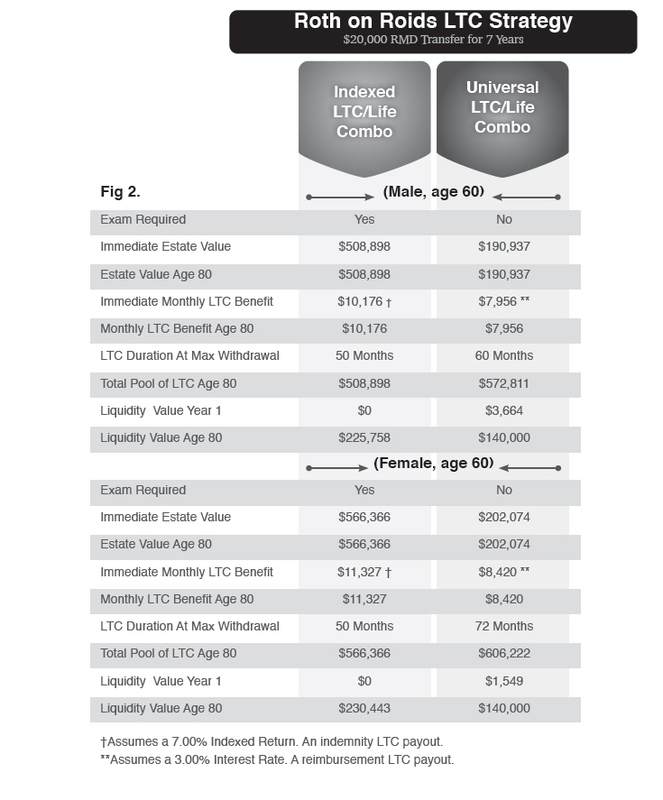 Currently the preferred LTC Hybrid option for married couples is the Joint LTC Annuity, where the monthly LTC benefit is payable to either spouse for 90 months. With the Joint LTC Annuity if both spouses trigger the LTC benefit, both receive a tax free benefit up to the monthly maximum until the LTC pool of money is exhausted. Where else can you place your investable assets and receive these kinds of benefits? There is nothing like it anywhere. $100,000 in a CD, money market account, or even a mutual fund is worth $100,000, nothing more. With LTC Hybrid Plans you have so much more, and definitely more peace of mind. ACTION ITEM: Pick up the phone and call our office today and request your personalized illustration, Application Kit and information packet. Next you will want to submit an application to see if you can qualify. With many LTC Hybrid Plans no medical exams are required, so applying is actually very easy. Don’t hesitate, call us right now while you are thinking about it at 1-888-892-1102.
www.epmez.com and go to the LTC Hybrid Plan tab. Cable TV, car payments, dinner for two, home owner’s insurance and traditional Long Term Care insurance are examples of an expense. Something we have to budget for. LTC Hybrid Pans are, simply put: An asset transferred - from your left pocket to your right pocket. When you list your assets on your balance sheet, your LTC Hybrid plan will be on the left side of the ledger. A positive entry. More important however, is the fact that LTC Hybrid Plans will provide the needed cash to take care of your long term medical expenses should you ever be in a position where you cannot perform 2 of the 6 Activities of Daily or you become cognitively impaired. If you are fortunate to never trigger the LTC provision of your LTC Hybrid Plan, an expanded benefit is passed to your beneficiaries, avoiding the “use it or lose it proposition” of old. The Federal government cannot take care of our long term medical expenses. It just isn’t realistic. There are too many of us. We constantly see and hear evidence of how our social security income is in serious jeopardy. If this is true, how in the world can the feds add long term medical care for every senior into the budget? This responsibility falls on our shoulders. Unless we are willing to trade in everything we have to qualify for a federal handout, we need to step up and meet this crisis head on. 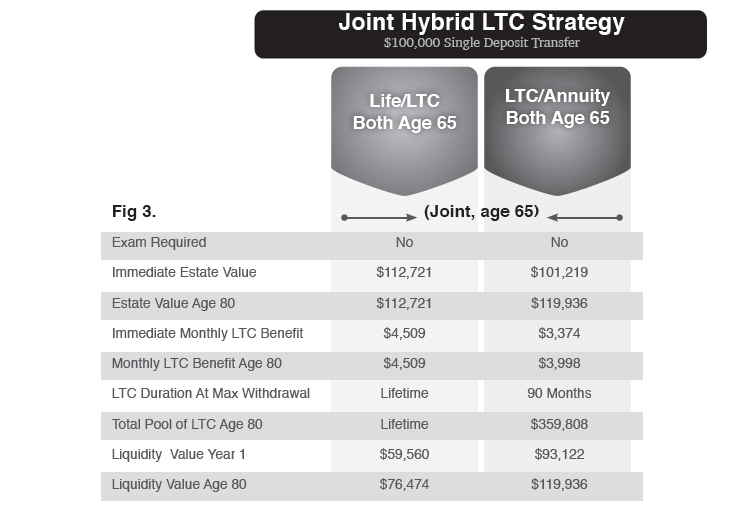 LTC Hybrid Plans are the most sensible and practical way to do just that. You owe it to yourself and your family to protect what you have worked a lifetime to create. Call our office today: 1-888-892-1102 to request your application, personalized illustration and information packet. Live well and leave a legacy.